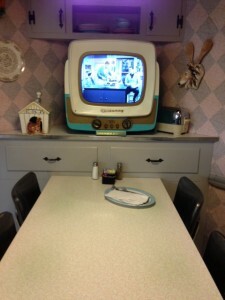 Located in Disney’s Hollywood Studios, The 50’s Prime Time Cafe is probably one of my favorite spots to visit for a bite to eat. Though I prefer it as a lunch option, dinner here also does not disappoint! When you step into the 50’s Prime Time Diner you are stepping back in time to a world where mother knows best, elbows are not allowed on the table, and you have to finish your meal to get dessert. You will find each table is set to look as though you are sitting in a kitchen of the 1950’s. The decorations are time appropriate and black and white televisions play food related clips from classic TV shows such as Leave it to Beaver and Father knows best. You are served by cast members who take on the roles of family members such as aunts, uncles, and cousins. They will remind you of your manners and insist that you help set the table. They are very animated and truly transport you to a different era. They also provide a ton of entertainment! When it comes to the food you can always count on an enjoyable meal here! That being said, a lot of guest are surprised that they do not offer standard fare such as burgers. This is because you are not eating at a diner, you are eating in a family kitchen and should expect home style food with a dash of nostalgia. Some of my favorites include the fried chicken, the chicken pot pie, and the meatloaf. For dessert the most popular item is the s’mores which are absolutely just as you remember them tasting…delicious! This is also a great place to get a milkshake and the PB&J shake is out of this world! Next time you are making your reservations for dining you may want to consider a trip back in time at the 50’s Prime Time Cafe! This entry was posted in Dining and Restaurants, My thoughts, Uncategorized, Why I Love and tagged 50's Prime Time Cafe, Hollywood Studios. Bookmark the permalink. ← Too Little to Ride? No Problem!